Nick Dunston is a bassist, composer, scholar, and cross-disciplinary collaborator. His performances have spanned a variety of venues and festivals across countries in North America and Europe. He's performed with artists such as Tyshawn Sorey, Matt Wilson, Jeff Lederer, Amirtha Kidambi, Vijay Iyer, Marc Ribot, Jeff "Tain" Watts, and more. As a composer, he's written for and collaborated for a wide range of artists, from solo instrumentalists to performance artists. As a writer, he's contributed monthly to Hot House jazz magazine since 2016. 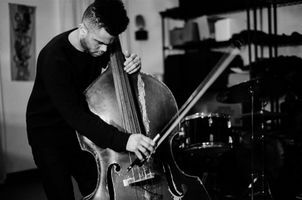 Nick currently studies at The New School and is on track to graduate with a BA degree in Contemporary Music and a BFA degree in Jazz Performance.